Let us know your power supply requirements and we provide the solution. Please tell us the input and output specifications in terms of voltage and current, the mechanical size required and special regulatory requirements such as safety and EMC requirement. Please contact us and we shall help determine the detailed specification. Upon confirmation of specification a project quotation will be provided. This quotation will include engineering charge involved and royalty if any payable at the time of production. We develop electronic assemblies and deliver prototypes and documentation for manufacturing. We shall work closely with the manufacturer and work out the most competitive product. We have technologies that can make your products stand out from the rest. 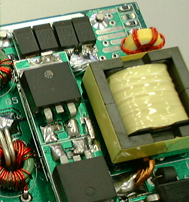 If you want to cut the cost of your existing power supply products we can help by redesigning the electronics and cut component cost while maintaining product performance. We will sign NDA (No Disclosure Agreement) and evaluate how far can the cost saving can go. Product Range : switching power supplies, battery chargers, AC adapters, AC/DC converters, DC/DC power converters, high frequency lamp ballasts, DC/AC inverters, power converters for LEDs, etc. If you want to make measurements on power supply products, we shall carry out tests and provide a detail report. If you want to expand the knowledge and capabilities of your staff, we provide a series of one-day or half-day training courses on switching power supply technologies. Some of the courses are intended for fresh and inexperience engineers which help them master day to day work quickly. Some of the courses are intended for engineers with some experiences which provide more in-depth switching power supply technologies. On-site training is available. The courses can be delivered in Putonghua or English upon request. • Click here to download more details and the quotation. PowerEsim is an Online Design Tool for switching power supplies. Go to the specific website and have fun.